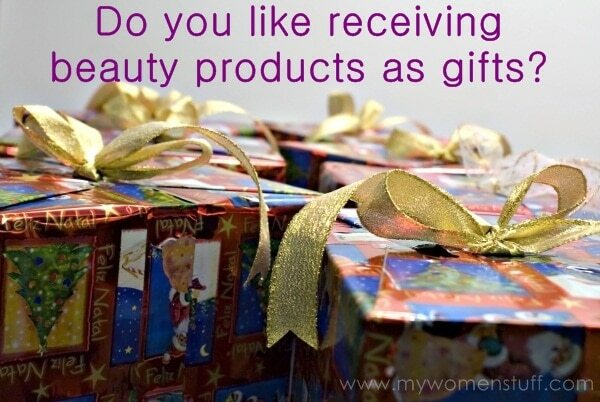 Home » Interesting Discussions » Your Say: Do you like receiving beauty products as gifts? Your Say: Do you like receiving beauty products as gifts? I read Viva Woman’s post last week about whether her readers liked to gift beauty products, where the comments were quite a mixed bag; and I was surprised to see it was mostly no. I, however, personally do. I love giving nice beauty items I like or that the recipient may not normally buy for themselves, because I feel that beauty items are an self indulgence. It’s a way to spoil someone because it’s for them and them alone, unlike a box of chocolates that is usually shared 🙂 That said, like everything else, gift giving and the reasons behind it are a personal thing so there’s no right or wrong way. However my question to you is, do you like RECEIVING beauty products as gifts? I do (naturally!) 😀 It’s always fun to play with something new or perhaps something you’ve been wanting to try but didn’t get round to. Bath and body products are always nice, as is something tailored to your likes; like a nail polish or lipstick colour you like, or something that pushes you out of your comfort zone. Your say: Do you like receiving beauty products as gifts? Or perhaps you think it too personal because of scent, ingredients, colour preference etc and would prefer receiving non beauty items? NEXT POST: I’m Curious: How do you feel about regifted gifts? Do you do it? I do! So I can try out products that I may never buy for myself 😀 but of course, if its a non beauty item but the sender knows what I need or want, double happiness! I like gifts and I love to give them. It’s a challenge for me (one that I like!) to find gifts that would perfectly suit the recipient (hopefully!). i do! i think it’s such a fun surprise to receive beauty gifts. I love gifts, beauty or otherwise! Of course I love to receive ones on my mental wish list, but it’s fun when it’s a product that the giver really loves that I’ve never tried. I more or less like practical gifts, and beauty gifts are definitely practical. I LOVE receiving beauty products as gifts! There is so much out there to experiment with / try out! In fact, I’m ridiculously envious of countries where beauty box monthly subscriptions are available. gifts are gifts!whatever it may be, it should be appreciated 🙂 for a beauty product as a gift? of course i would love to! but if anybody would give an iPhone 4s as a gift, I will be forever grateful.. haha! If by beauty products you mean makeup then yes I wouldnt mind. But as for skincare products then no coz I have sensitive skin and would rather stick to what I’m used to, unless they shower me with the same brand 🙂 But like most said, a gift is a gift, if I dont like it then I’ll just pass it to my mom or sis. Of course I do! Most especially if it is something that I will not buy for myself, hahaha! Besides, it is always good to try out new beauty products for me 🙂 But of course, what’s important is the thought of the giver to give me something! I would love to receive beauty gifts but giving depends on the recipient as beauty gifts are really not on the list and lot of times, they are a personal choice!!! The latter is true too, but if we all thought that way, we’d never receive any beauty products as gifts either 🙂 I think if it isn’t too personal e.g. skincare, its usually quite well received. I do! It’s always nice to have some new beauty products to play with! bahahaha…that’s right…Malaysian’s say “bathe” when it means “shower” to us, Brits. I get confused when my in-laws use “bathe”. And “shows” when it’s “movies”. hehe yes for us, body cleansing is bathe maybe because a bath is quite a foreign concept – sitting around in dirty bath water… ermmm…. 😛 And I don’t like Lush anything 😛 The only thing I like from Lush is the Happy Hippy shower gel. If you get to try it, do. It smells lovely and citrusy, light and its a shower gel so none of those bath bomb thingys that I don’t know what to do with them either since I couldn’t possibly just drop it into a pail and watch it fizz? LOL…yes, I get the sitting in dirty bathtub water is SO yukky!!! I dont know why people relax in bubble bath. EW!!! I shower first, THEN sit in a bath – its lovely and relaxing if the water is hot but not too long or I feel like puking. I’d never get into a bath without showering first 😛 We don’t have a Lush store here so my last visit was in the UK to run some errands and oh boy! headache indeed! I do like the occasional bar soap of the herbal kind. But otherwise am still a shower gel fan all the way. I do love getting beauty product as a gift. I LOVE getting anything as a gift anyway. But sometimes, people would introduce new stuff that is new to me or would not buy because I am afraid of regretting buying it. My boyfie once gave me a Revlon eyeliner in a Parker pen box (which I think is quite funny). I think it is odd for him to give me an eyeliner all of a sudden. It wasn’t even my birthday to begin with. Then I asked him if someone told him to buy one for me. He said nobody told him to. It just he saw my eyeliner pencil is getting short and sharpening it seems a hassle. So he remembered his sister have this kind of (he said) “mechanical” type eyeliner which she kept bragging about to her friends in school. Just twist the wand to let out the crayon. Isn’t it handy? For one moment, I thought my boyfie is a makeup artist but pretending not to be. LoL! But thanks to him a learn a few of make up items that worth trying. That’s a cute and sweet story. Its nice receiving something new and different because it may just turn out to be something we like! I usually give it to my sisters because I knew they don’t have resources to spend on it. I find perfumes tricky so I try not to gift perfumes too hehe… but its sweet of you to spread the joy to your sisters – I’m sure you make them very happy!